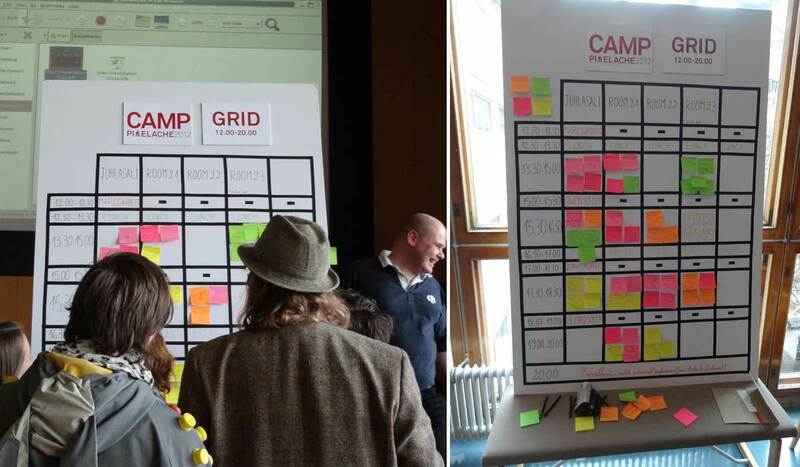 Ever been to an “unconference?” Camp Pixelache, which I attended a couple of weeks ago in Helsinki, Finand was organized in a unconference style. I had never been to an unconference, but I quickly learned at the opening session where an overview of an unconference was given. Unconferences came about because people felt that a formal conference that usually has longer scheduled sessions are good, but the ad hoc conversations in between the sessions were really interesting and great. The question arose, how can we make more of this? The answer was to have an unconference, where a event with sessions is organized first on a wiki site with proposals, and then the schedule is setup the day of the event with the particapants in attendance. There is a large open grid that is setup – and you post wher and when and with who you will present. The schedule is made or broken by everyone at the unconference. Sessions are organized by participants. There is only one rule to obey which is called the “Law of Two Feet.” Basically – if you are not in a space where you are learning or contributing – you use your feet and go somewhere else. The day was to be considered a “gift economy,” where you are giving and taking with others at the unconference. There were many sessions scheduled at the same time – and we were encouraged to remember that “what ever happens is supposed to happen.” The sessions were also broken up with several keynotes – which were speakers that were invited and scheduled to give longer presentations. Unconferences come out of the open source community. The format and methods used are said to have been developed by Harrison Owen in the1980’s. His book published in 1993, Open Space Technology: a User’s Guide discussed many of the techniques now associated with unconference. Typically at an unconference, the agenda is created by the attendees at the beginning of the meeting. Anyone who wants to initiate a discussion on a topic can claim a time and a space. Unconferences typically feature open discussions rather than having a single speaker at the front of the room giving a talk, although any format is permitted. After going to my first unconference, – I can’t wait to attend another. I also am thinking about organizing one here in Cleveland – around creative ideas, technology, and social change.